Get your bulbs planted asap, they like the autumn warmth and will reward you for years to come. An early bulb whose small flowers have an inner sparkle these Chionodoxa are also called Glory of the Snow. Judging by the current weather we are in for a good showing this spring. These bulbs can be planted under deciduous shrubs so they can catch early sun but like open positions. 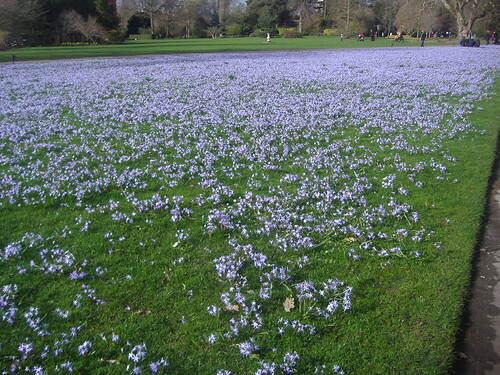 They can be grown in a lawn with crocus, in a container or a rock garden. After flowering in February or March give the well drained soil a light sprinkle of bone meal to encourage offsets and build up the bulbs. Chionodoxa forbestii is a pure deep blue with the familiar white star like centre. Chionodoxa forbestii Rosea or the Starry Pink Giant are other colours to try. 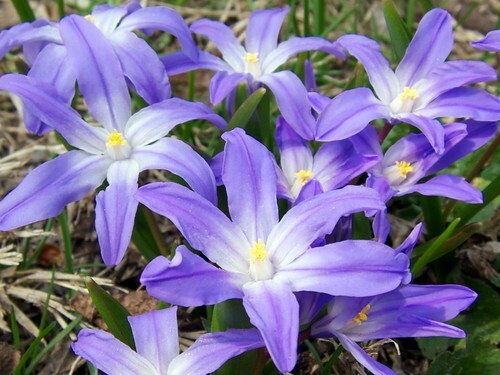 The sky blue Chionodoxa lucillae gigantea will flower 4-6″ tall and self seeds freely. Plant in early autumn as the roots like a bit of warmth to grow. Chionodoxa need water in the spring so if the ground is dry water regularly from the emerging of foliage until the leaves die.